Home / TallyERP.9 Lessons / How to manage Bill-Wise Accounting in Tally.ERP9? 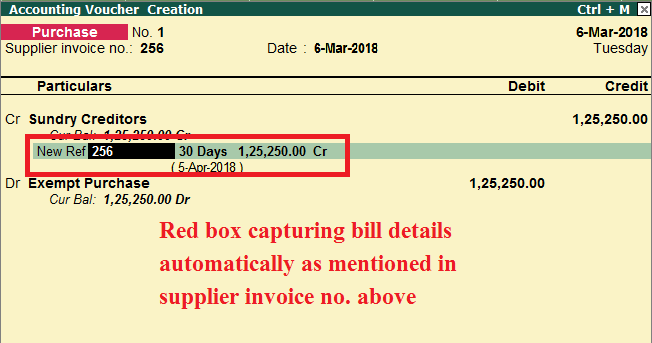 How to manage Bill-Wise Accounting in Tally.ERP9? Did you know that tally provide you to do accounting bill by bill. It means each invoice can be maintained bill wise. For Example, you purchase goods from a supplier and raise debit note and make payment after debit note, then tally give you actual and correct position of payable amount. Not only payable amount Tally also give you option to make Outstanding details in the name of supplier. You can export the outstanding ledger in Excel, PDF, JPEG format and mail to the supplier. Go to Gateway of Tally - F11: Accounting Features - Set Yes to maintain Bill wise details. Select yes to non trading account also. Now when you create ledger account, system ask you each time to maintain the ledger bill wise. Select Yes if you maintain details bill wise or not. Selecting yes means your all vouchers having bill wise records. Now create any Sales / Purchase / Journal Entry. For Example: Tally Knowledge purchase goods of Rs. 125250/- from Sundry Creditors and return goods of Rs. 35000/- through debit note. In this case our first entry will be a purchase entry. Now we pass a debit note for goods return, to enter debit note go to gateway of tally - accounting voucher - and press Ctrl + 9 or click on right side bar Debit Note option. Enter original invoice no and date. Now enter party name in Dr. Side and enter the amount of debit note. System will show you list of invoice for which debit note will be made. Select the invoice for which debit note generate, debit note for purchase also net off your purchase amount. For check outstanding payable balance to creditors go to Gateway of Tally - Display - Statement of Accounts - Outstanding - Payables. 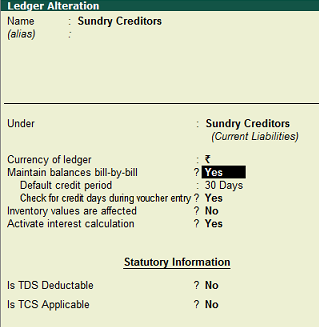 Select ledger name for a single ledger or all ledger for all payable ledger account in books. You can generate confirmation of outstanding balance at this stage. 1. Ageing by Bill date. 2. Ageing by due date. 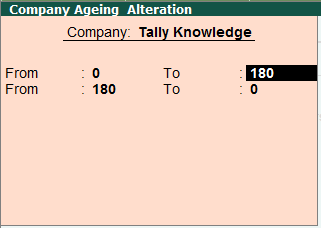 Ageing by due date is allow you to watch the invoice which is appear due to pending because of use of Credit Limit. If you select All Items in payable list then press Ctrl + F7 to segregate the party wise details and press F1, details of bill wise outstanding will be appear on your screen. Similarly you can use any ledger (trading or non trading) bill wise for your account. It will simplify your accounts and you can easily locate which account is payable / receivable. It save your lots of time and hard work. Now go to payment voucher to know how much amount to be paid to creditors (after adjustment of debit note). So make a payment voucher, enter party name. After entering party name enter any amount, payable bills automatically appear on your screen. you also can select each pending bill details to make the payment. In this image, we make a payment voucher and system show us for how much balance to be paid to creditor. You can also manage your bank loan, staff loan, or any other account with Bill wise details.